Daily fantasy sports (DFS) is a big hit across the globe, but especially in the US. 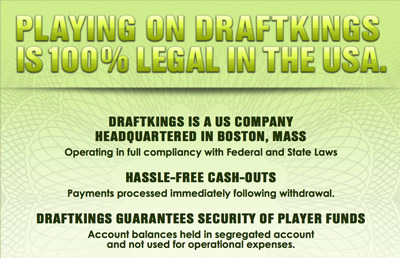 In fact, Draft Kings is limited to USA and Canada players at the moment. We’re sure many eSports followers also favor fantasy betting from time to time. In a time of need (Vulcun closed real money fantasy recently), one of USA’s largest fantasy betting sites, Draft Kings, have started offering eSports competitions. In this review you can find out more about the daily fantasy eSports markets at Draftkings. The amount of competitions at DraftKings is second to none, but the company decided to enter the market only with League of Legends in mind. Taking LoL’s popularity in consideration, it doesn’t come as a huge surprise, but still a big chunk of the eSports player base will be disappointed. Currently the company is having daily fantasy leagues for the League of Legends LCS 2018. Read more about paid Fantasy LCS here. When creating your fantasy team, you will have a virtual $50,000 in hand. You get to choose a roster consisting of 8 players from a minimum of 2 different games. The maximum amount of players chosen per team is 4. The DFS competitions themselves have flexible entry fees and varying prize pools, and there are several tournament types to boot. How to find eSports at DraftKings? DraftKings have done eSports justice and displayed it at a major location on their website. As soon as you enter the lobby, you can find eSports to the top right of your screen. Also, the site has a dedicated eSports betting section with various betting tips and news. The fantasy site welcomes all new players with a 100% match up to $600 bonus. The bonus is released in small increments as you play in real money tournaments, rather than receiving the full sum immediately. By entering a real money contest, where you win or lose you will earn FPP (Frequent Player Points). 100 FPP equate to $1 of your bonus released. There are all the options you can use for depositing and withdrawing. In addition, withdrawing is also possible via Cheque payments. According to statements of DraftKings representatives playing fantasy sports doesn’t technically fall under betting or gambling, therefore it is completely legal across the USA. The company has its headquarters and company license in the United States. Draftkings pays out massive sums each passing day, and it is one of the leading DFS sites across the US, therefore your money’s safety should be of no concern at the moment. On entering the League of Legends real money fantasy market, Draftkings announced partnerships with some of the most popular eSports teams like CLG, TSM, Cloud9 and many more. The video below was posted to introduce these new partnerships. The website doesn’t offer live chat and/or telephone support we’re all used to by now from all bookies. If you have a certain query, you will have to resort to e-mail or actual physical mail. The operating times are 9:00 AM – 11:00 PM EST Monday through Friday, and 10:00 AM – 7:00 PM EST on weekends. DraftKings is a top of the line fantasy site with plenty of variety from all aspects but one – the eSports markets. We’re hopeful they add more games in the near future, as the website offers everything a fantasy player needs.